Lyburn farm lies on the northern edge of the New Forest, straddling the small river Blackwater, and has been farmed by the Smales family for the last 50 years. The river Blackwater rises on some of the high ground of the forest and as the heather and gorse gives way to the old ancient oak forest, home of the fallow deer, the countryside falls away sharply towards the north. The name Lyburn, is in fact quite unique, it is derived from the Scottish, lye ‘born’, and burn ‘river’, ‘borne by the river’, and with the Blackwater on either side we certainly are. The whole operation of producing cheese is very much a team effort. Phil has been at the farm a long time now and knows each of the cows as individuals. His job, as herdsman, is to produce clean wholesome, good quality milk with low cell counts. The cows produce about 1.3 million litres of milk a year, of which we turn about 50% into cheese. James, will then use his skills as a cheesemaker, to turn the milk into curds. Then, eventually cheese, over a period of 10 weeks to 18 months. Andy, Steve and Amy then look after the maturation of the cheese, the packing and distribution. Jono the eldest son will look after the farm and do the muddy boots bit, mother Judy will look after the farm office. Lyburn Gold - £4.20 Ripened for about 8- 12 weeks it has a creamy smooth texture. The Lyburn Gold has consistently won prizes at the British Cheese Awards over the last ten years, and 2016 adds another Silver, 2017 adds another Gold and 2018 a Silver. Lyburn Lightly Oak Smoked - £4.60 This cheese is based on the Lyburn Gold, still a washed curd cheese, to give a light and delicate flavour. 2018, Silver Award at the British Cheese Awards, Bath and West Show. 1 Star Gold at the Great Taste Awards in July. Silver Award at the World Cheese Ceremony in Norway. Lyburn Garlic and Nettle - £4.60 This cheese is made to the same recipe as the Gold, but it is not matured for quite so long. As the name suggests, there is a hint of garlic and onion, and the other ingredients are chives, parsley, paprika, ginger, and horseradish, the nettle giving the cheese a touch of colour, that can be quite clearly seen. The garlic has however, not been included to such a level that it is too overpowering, and this presents a young well balanced cheese that pleases most people. For 2017 we received a very Highly Commended from the International Cheese Awards in Nantwich. The garlic and nettle remains a big favourite down here in Hampshire! Old Winchester - £4.10 A much harder cheese, becoming more reminiscent of an Old Amsterdam with a distinctive nuttiness in flavour. 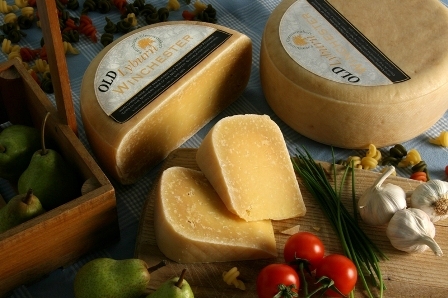 Because Old Winchester is made with a vegetarian rennet it can be enjoyed as a vegetarian replacement for a hard Italian cheese, and yet can still be used as a table cheese, it has that bit more versatility. 2018 Two silver medals at the Artisan Cheese Awards at Melton Mowbray. Silver Award at the British Cheese Awards at the Bath and West Show. Gold Award at the International Cheese Awards in Nantwich Cheshire. Two Star Gold at the British taste awards.